From Tria’s hair-removal laser to Julep’s toxin-free nail polish, the top venture capital-funded beauty startups of 2014 blush over a vast array of cosmetic needs for women. But that doesn’t mean men are going unnoticed. In fact, according to PitchBook data, two of the companies that raised the most in VC funding last year were Harry’s and Dollar Shave Club, shaving startups which cater to the scruffier demographic. Each service offers a monthly blade refill service that can ship shaving products to homes. Harry’s sells products and subscription plans that can be tailored to how often one shaves, while Dollar Shave Club delivers monthly. Of all U.S. early-stage VC deals in 2014, Harry’s in New York City ranked ninth largest. Since launching just in 2013, it has secured more than $200 million in funding, with subscribers in “the hundreds of thousands,” according to a spokesperson. Dollar Shave Club, meanwhile, raised $50 million last year and counts 1.7 million subscribers. Helping men manage stubble isn’t the only opportunity in men’s grooming. According to market research firm Euromonitor, 2013 marked the second consecutive year that growth in men’s toiletries (shampoos, lotions, etc.) outpaced growth in men’s shaving. Shaving actually fell by 1 percent, while men’s toiletries grew by 3 percent. Overall, men’s grooming is expected to hit $6.5 billion in sales by 2018. Dollar Shave Club, headquartered in Venice, Calif., is expanding in response to these trends. 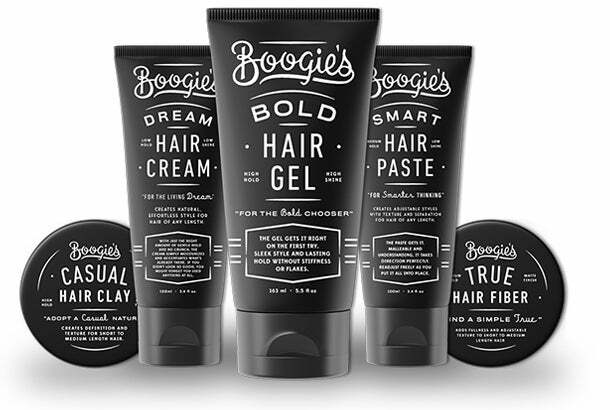 Today it’s launching “Boogie's,” a line of hair styling products that include gel, clay, cream, paste and texturizing fiber. After seeing growth in the overall men’s haircare market, Dollar Shave Club co-founder and CEO Michael Dubin dug deeper into feedback from subscribers and found that three-quarters of them used hair-styling products. “This alone made a compelling reason to enter the market,” he says. Dollar Shave Club is betting Boogie's will give it a big boost: it projects revenue for 2015 to top $150 million, more than double the $65 million it saw last year. But it will have to lather up against major contenders. At present Procter & Gamble commands 40 percent of U.S. men’s grooming sales through longstanding brands like Gillette, Old Spice, and Clairol for Men, according to Euromonitor. Dubin isn’t afraid. “Generally, men agree that bigger brands don’t understand them,” he says, adding that many affordable products fail to address men’s needs for hair fortification and scalp health. He also believes men are frustrated by the lack of guidance they have in choosing the right products and need someone to “hold their hand.” To that end, Dollar Shave Club is also unveiling “Boogie’s Match,” a personalized product finder that ask members a series of hair-styling questions to customize product recommendations. Men’s skincare and anti-aging is another frontier for beauty. Dr. Paul Jarrod Frank, a New York City-based dermatologist is product technology advisor to Estee Lauder’s Lab Series for Men, part of the cosmetics giant’s standalone skincare group for men. As The New York Times reports, Estee Lauder launched it last year with potential plans for growth acquisitions in 2015 and 2016. Dr. Frank says a little over three years ago he informed the company that his website’s info-videos for male cosmetic treatments -- like specialized liposuction for male abs and non-surgical neck-lifts for sharper jawlines -- saw a spike in activity between 12 a.m. and 2 a.m. He concluded that men researched cosmetic options during these witching hours because many still think it’s taboo to have beauty regimens or use personal care products, let alone undergo aesthetic procedures. “Fortunately, skin care technologies now allow us to pack quite a bit into one bottle,” says Dr. Frank. For instance, the Lab Series after-shave is also a skin hydrator with antioxidants to battle aging. Another brand focused on simplifying men’s beauty regimens is Turo Skin, a niche men’s line that makes multi-beneficial products. With their customers’ stuffed gym bags in mind, the Michigan brand has created a 3-in-1 product that rolls a high-performance shampoo, cleanser and moisturizer into a single formula. Not all brands believe in the all-in-one philosophy. Miami-based Luxury Brand Partners, the makers of Oribe and other top-rated products for women, also entered the male market last year with its V76 by Vaughn line. Instead of multi-purpose products, V76 by Vaughn sells skincare, haircare and shaving with more nuanced options, such as styling gels that come in ultralight, medium and strong. It even sells a hydrating face mist and brightening shampoo for silvering hair, hoping to unearth male beauty junkies of all ages.